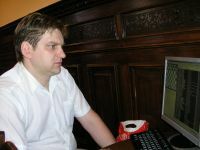 Ivanchuk opted for the same line of the Petroff Defence, which he used against Leko in Monaco-2006. White deviated from Leko-Ivanchuk on the 12th move. After 12.Be3 Nac5! (introduced in Smirnov-Motylev, Sochi 2004) Black equalized easily. 0,5-0,5. A topical line of the Najdorf with 6.Be3 e5 7.Nb3. Instead of the more popular 14.Nd5 Grischuk played 14.f4! ?, and on the 18th move he made a new move 18.Bd3! (instead of 18.Bg2, Bogner-Areshchenko, Aarhus 2005). Later, White sacrificed a pawn by 19.Nd5 and developed a dangerous initiative. Areshchenko spent a lot of time for the unobvious move 21…Rсe8. After that White preferred to regain a pawn, sterilizing the position. 0,5-0,5.